A personal interview with Mercedes Escobar, singer extraordinaire. Listen to the interview and some of Mercedes Escobar’s remarkably beautiful music below. The “play” button, apparently, is invisible, but you should be able to find it without too much trouble. Mercedes Escobar is a modern, twenty-eight-year-old woman from Guatemala City, whose soul, apparently, has been colonized by a legion of blues, country and ranchera singers from the nineteenth and twentieth centuries. We’re not exactly clear on how this all transpired, but it is rumored to have something to do with a well-attended poker game, Mephistopheles, mezcal and the promise of several first-born children. Whatever the origin story, Ms. Escobar has a voice that will punch holes in your soul while simultaneously easing all your pains and recalling past glories. Fortunately for us, La Cuadra Magazine has had a front-row seat to her development as a singer, songwriter and performer over the past several years. That connection allowed us to land an interview just as she has released her first EP and video. 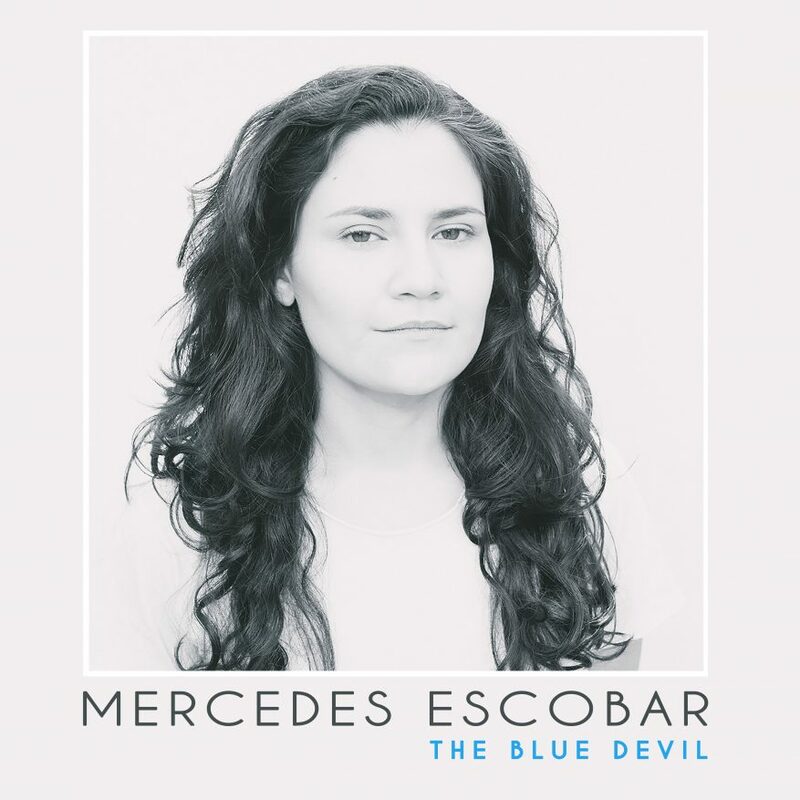 The EP, a five-song tour-de-force of her varying styles and talents, The Blue Devil, is available for streaming and download at MercedesEscobar.com. The video for her first single, Sangre Negra, directed by the radically talented Eny Roland Hernandez, and produced by her brother Mauricio with La Danta Films, can be seen on her website or on YouTube.com. Thanks for taking the time with us, Ms. M. Much obliged. The following conversation is excerpted from a longer interview that is available for your listening pleasure at LaCuadraMagazine.com. Michael Tallon: Mercedes Escobar, thanks for spending some time with us today. I’d like to jump right in with what is perhaps an odd question. What is the last song that made you cry? ME: Well, first of all, there are several songs that have the potential to make me cry. But, interestingly enough, it wasn’t really a sad song which made me cry — it was a very happy song. It was a showing of an André Rieu concert. He is a famous director who is also known for playing the violin as he conducts. He plays pop in a classical context, but I don’t necessarily think that’s a bad thing. I think it is actually wonderful because he makes classical music more approachable for people. The amount of people who just show up to hear him play, just to be happy, to feel happy, is incredible. So, to the point, it was one of the songs where everyone joined in and everyone just looked so incredibly happy — and when you have thousands of people singing at the same time, I think that is incredibly overwhelming. That made me cry. MT: I can appreciate that. I have had that experience before. I remember one evening walking through Antigua, where I call home and you call home, hearing some of the penitents who were celebrating Semana Santa in the central park and it was a beautiful sound, and I just found myself welling with tears. Those emotions, they are shared by pretty much everyone in the world, of course. What is it about music, do you think, that brings it out? Is it the music itself? ME: I think it is the sharing that happens through music, the way we feel connected to each other when we hear music. Not all the feelings have been pinned into words, I feel. So, yeah, I feel that it makes us connect. MT: Do you feel that connection from stage, when you are performing? Because I know that I felt it as a concert-goer, when I’ve been there listening to the music. But, what is it like from stage? ME: Well, I must say it is one of the reasons why I perform live. That feeling. Often, I look down from stage and I see the smiles on peoples’ faces, or I see their mouths just hang open, or [I see them] crying. Crying is way more intense. It is very satisfying to know that I am really transmitting this, because that is why I do it, really. MT: You do a lot of your own songwriting. How does it feel when you see someone singing words that you wrote, when you are on stage or hearing yourself on the radio? ME: I feel fulfilled. I feel like I did something right and it actually inspires me to want to write more. I don’t know if you knew this, but I did not always identify as a songwriter. It took me many years to really connect with that part of myself. Originally, I considered myself as an arranger, you know, doing all these traditional songs and just retooling them in a different way. MT: Do you remember what it was that allowed you to make the transition from arranging other peoples’ music to writing on your own? Because you write fantastic songs! When did you make the transition? How did you make the transition to writing? ME: Honestly, it started in a not-so-romantic way. I realized that as a musician, I had to write my own songs if I ever wanted to be considered an original. That said, I have been writing songs since I’m ten. Obviously they were not the same quality and I never shared my first album, which I recorded when I was fourteen. MT: You play quite a lot of traditional music. What type of traditions are we talking about here? ME: We are talking mostly about music from the first half of the nineteen-hundreds in the United States. I actually did not get into traditional Mexican music until more recently. [Growing up] it basically was a lot of blues, a lot of country-blues as well. I loved Howlin’ Wolf, for example. The first blues song I wrote is actually a tribute to Howlin’ Wolf. MT: What is that song? ME: It is called Ghost Blues. It is a tribute to him and one of his songs, I Ain’t Superstitious. [ His song] goes, I ain’t superstitious, but a black cat just crossed my road. In response, I wrote, “I know I ain’t sane, but I’ve just seen a ghost.” I wrote that when I was sixteen, probably. MT: A 16-year-old high-school student in Guatemala City writing a response to a-hundred-year-old Howlin’ Wolf’s song? ME: Yeah . . . I mean, I don’t know if it is a hundred years old, but it is at least fifty. MT: Both I Ain’t Superstitious and Ghost Blues clearly come out of a tradition of American blues music. [But they also come] out of a superstitious culture with the spirits and black cats and all. Some of that, I think, exists in Latin American music and culture, as well. Does that have any influence on you — that mystic world? ME: Oh, absolutely. I really love all the elements in magical realism. It is one of the main influences in the lyrics that I write. In Spanish [my songwriting] is very heavily influenced by that. For example, one of the most famous traditional Mexican songs, La Llorona, has had a very strong impact in the way I write. I think it, really, in a way, has to do with the place where we live. That is why I live in Antigua, Guatemala. You would have to be really cold — and somehow not very sensitive — to not feel the magic that goes on in this place. You actually mentioned earlier in the interview when you teared up at a Holy Week procession. It is just so shocking, and it is impossible not to see it and to feel it. I feel that the same applies to Mississippi. This is not just a Latin American thing. I have just been to Clarksdale, the crossroads town, where Robert Johnson met with the Devil. I really do not believe that was the actual place. Still, it’s just impossible not to feel it. You have a crossroads where, on one corner there’s a cemetery, while on the other side there’s a church, on the other one there’s a children’s park and on the other one there’s a bar — one of the oldest bars in the South. So, it is just so wonderful to have that there and you just feel it. MT: I want to note something here: Your answer to that [question] was fascinating: You went to the crossroads where Robert Johnson met with the Devil, but you don’t believe that was actually the crossroads. The crossroad for the tourists might be fake, but there is no doubt that Johnson met with the Devil! I think that if you can understand that, then you can understand magical realism. That is brilliant! How does that sense of magical realism come out in your music? ME: Well, I think you would have to listen to Sangre Negra. It’s a song I wrote in Antigua. It was the first time I had mezcal in my coffee, actually. I felt this thing. It is, in fact, why I called the album The Blue Devil. I just had this indescribable feeling of . . . I just needed more magic. I do not even know how to explain that moment, but I guess that is why we write songs. MT: You were having your coffee and mezcal before you wrote that song, and you felt the need for some magic. By writing that song, was that an expression of your ability to create magic? ME: I just realized that, if I couldn’t find what I wanted from someone else, I’d have to do it myself. In this context, I really feel that I have somehow found my voice. I’m not talking about my singing voice, because that changes constantly. I mean, more like my writing voice, my songwriting voice. I feel like I am now able to really connect the dots. MT: Once you felt that connection in creating that song, it started to flow more easily and the other songs started to come? ME: Yes. Basically it was that once I saw the reaction the song had on people — looking out and seeing people crying and everyone telling me “I got goose bumps” — that is something that I now aim for. Not just in a sad context. In whatever emotional context it may be, I want to connect with my music. MT: I would like to have you speak a little bit about when you are on stage. I want you to speak about how you try and bring together all the magic of a show. ME: I guess it’s all about the people who are there. I would not be able to do this on my own. I’d get exhausted all the time. MT: Do you mean the musicians being there or the audience members? ME: Audience. I can also do a solo show. [Though] it helps, for sure, when I have someone wonderful playing with me. It is always better. I don’t feel as lonely — and they also inspire me. When we are connecting on stage, it’s a beautiful thing . . . and I love the musician’s smile. We have not really talked for half an hour, but we can look into each other’s eyes and smile because that is how we communicate, right? But with the audience, it’s more that . . . When they . . . I do not know if they know that they have such a strong influence, every person. When they are paying attention, when they are engaged, it just gives you so much power as a performer. I think the more engaged they are, the better the musician is. [Their feedback] inspires the musician and makes them be better. I take a lot more risks when I am on stage and people are engaged. I will somehow try things that I have never tried before. MT: I’d like to turn to your new album. I get the reference for The Blue Devil, the name of your EP. As I recall, it comes from the Tennessee Williams play / John Huston movie, The Night of the Iguana. So, I have some idea of what the blue devil means. I’ve felt it in the bars where you have played, where others have played. But I would like to talk a little bit about what the blue devil means to you, internally, and also why you chose that name as the title of your first EP. ME: Well, there are five songs and I realized they were all different from each other. I really wanted to give the EP a unifying name, and I feel that the one thing that just is there, in one way or another, [in each song] is that blue devil. It is the feeling . . . It’s a mix of feelings that has the potential to overwhelm us, disturb us, cause anxiety, you know, angst, and at the same time tries to push us to look for more intense feelings. Go rampage and rage, and do all that kind of crazy things! It has to do with Sangre Negra, which translates into English as Black Blood. MT: So is the blue devil rage? ME: Well, it is everything at the same time. But yes, in a way. It is so hard to pin it down. There is no word for it, for sure. I feel that I also [described] it in a very nostalgic way in the song Chasing the Moonshine, which is part of the album. It is a country song. I intended for it to be done in a sort of old-country style. It is a song that says, in other words, if we go out in the middle of the night, let’s make this magic happen all together. Let’s not leave. Let’s just stay here. MT: It’s a living thing, the blue devil. To me — and I will ask if you feel it is true — it is something that, when faced inwardly, when you look at the blue devil in the mirror, he or she is on their own. When we all gather, however, maybe the blue devil is the unifying force that brings it all together. ME: Yes. I do not want to make it sound like a negative thing. Without it, we are just robots. MT: I think you are right and I suggest to all of our listeners that the best way for them to understand what you mean by the blue devil, is to come on down and listen to one of your shows. Mercedes Escobar, thank you very much for joining us. For the coming months, Mercedes’ most regular gig will be on Monday nights, nine to midnight, at Café No Sé, on 1a Avenida Sur, #11c, in Antigua, Guatemala. We hope to see you there and remind you to visit our website, LaCuadraMagazine.com to listen to the entire interview. Also, remember to visit MercedesEscobar.com to listen to The Blue Devil and see the video for Sangre Negra. Follow Mercedes on Facebook and Twitter. And why the hell not? Follow La Cuadra on Faceook and Twitter, too.